Lee Chin supports the club-only month in April but can understand the frustrations that managers hold towards it. WEXFORD STAR LEE Chin says he can understand the frustrations of inter-county managers who won’t have access to their players during the month of April. This month will be exclusively dedicated to club activity in the GAA, with Chin lining out in four fixtures for the Faythe Harriers side across hurling and football in the coming weeks. There has been some criticism aimed at this policy, including Tipperary hurling manager Liam Sheedy, who recently suggested that “22 of the 32 counties absolutely ignored (the club month)” in 2018. Chin insists that Wexford boss Davy Fitzgerald has “been very lenient” in allowing his players to focus on their club commitments before rejoining the county fold to prepare for their Leinster round-robin opener against Dublin on 19 May. But he also appreciates that some managers might feel it leaves them under pressure ahead of the provincial championships. “It is tough because you do so much work with your team and your set-up,” the Wexford forward told The42. “Look, every manager wants to hold onto their team and be prepared for what’s coming [later in the season]. I know that April is for clubs which I do agree with, but it’s very hard for a manager to just let you go for four or five weeks and not be together at all. “I can understand why managers get frustrated with it. And sometimes players can get a bit frustrated because if I’m not with the lads for a week, it feels like you haven’t seen them in ages. That’s only a week but if you’re waiting for four or five weeks, it just seems like another year and you’re starting another year. Chin essentially became a full-time hurler last year, a decision which generated much discussion about what the future holds for GAA players in terms of trying to balance their sporting and professional lives. Chin has taken the benefits from that year out and is now planning to open his own business, although he can’t divulge much of the details at present. “It was always a case that I was always going to end up doing something for myself so at the moment, I’m in the process of starting my own business. “I probably would have had a bit of a backlash [about becoming a full-time hurler]. Yes, it was something that I wanted to do to allow myself to focus on hurling. “And also, I probably didn’t know what I wanted to do with my life as a career. When I was younger, I worked in different jobs. I was in a warehouse and I worked as a barber for a couple of years but it was something I just didn’t fully enjoy doing and I didn’t want to keep chopping and changing. 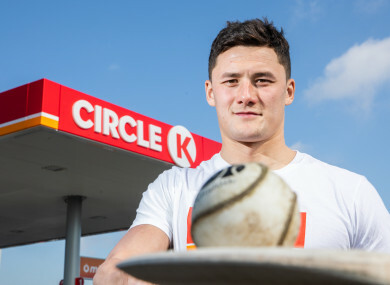 Lee Chin was speaking at the opening of Circle K’s largest service station across its global network on the M11 at Gorey, Co. Wexford. The opening of Circle K M11 Gorey will create 40 new jobs and is set to cater for up to 20,000 motorists daily with over 4,000 people flocking to the grand opening to sample a range of special offers to mark the celebration. Email “'It's very hard for a manager to let you go for four or five weeks. I can understand why they get frustrated'”. Feedback on “'It's very hard for a manager to let you go for four or five weeks. I can understand why they get frustrated'”.